The Endgame Tactician: Happy Thanskgiving! And may your belt fit tomorrow. A week ago Loomis crushed me in a couple Gruenfeld blitz games. I used to play anti-Gruenfeld lines, but my coach advised me that I undervalue control of the center, and that playing the mainlines would be educational. I'm White, and my position is collapsing. So I've been studying the Gruenfeld and sharpening my tactics. I also tried the Queen's Indian Defense for the first time in a correspondence game. Actually, his goose was cooked even before the blunder 16.Ra2??. And I think 13...Bb4 might have been a stronger move than 13...O-O. Happy T-day to you too. Thanks. Happy belated Thanksgiving from down under! New Post! Anybody have any ideas? I myself am learning the QID. I find the QID defence tends to lead to 2 results. If White is gung-ho, it tends to lead to complex middlegame struggles. If White plays it safe, the QID can lead to rather boring positions. I am fortunate in that my local library stocks a book called the Starting Out: The Queen's Indian Defence by John Emms. It's a very good intro book into the QID. 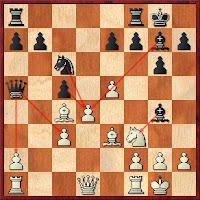 Emms discusses various positions arising from the QID (including the "modern" treatment with Bb4 ala Nimzo Indian style). I would recommend you have a look at this book if you're interested in learning the QID. A very belated happy Thanksgiving!